Should we go ahead together? You have a decoration or renovation project? Follow the Harmony Béton Guide. Decorative concrete has never been so easy! Harmony Pore Sealant is a water-based primer/pore sealant which is recommended for use prior to the application of Harmony Optimum Lacquer. Harmony Béton Premium Concrete sealer is a water-based lacquer for the protection of interior or exterior floors. Harmony Béton Premium Concrete sealer is recommended for normal traffic, both indoors and outdoors. This varnish concrete is an emulsion of resin monocomponent lasts that protects and beautifies concrete surfaces carried out to the helicopter. Want to revamp your kitchen? Keen to get rid of the joints in your tiling? We have designed a special waxed concrete kit for your work surfaces/cabinets. 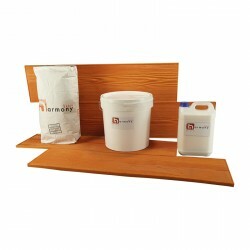 This kit makes it easy to create or renovate the finishes to your work surfaces and cabinets. With 30 timeless colours to choose from, you can bring an essential designer touch to your kitchen. Want to upgrade your shower ? We offer you a kit of polished concrete specially for the showers. To improve the seal, you can use our sub-layer Etanch' on the whole substrate, or the special kit angle. The waxed concrete floor kit contains all the products necessary for producing a waxed concrete surface. You will be able to produce a 2, 5 or 10 m² surface. On tiling, it is recommended to use the waxed concrete floor kit for tiling. The Harmony Béton XXL waxed concrete floor kit has been specially designed for the production of floor surfaces, and includes all the products required for laying: bonding primer, mortar and Premium finishing lacquer. Suitable for application in a 2 or 3 mm layer, and available in 30 colours. On tiling, use the XXL Tiling kit. Ras-le-bol of your old tiles ? You have a little bit of reservations to put a coating over it ? You don't have to break everything ! We offer you our kit concrete waxed XXL for your tiled floors. A quick and eco-friendly. This kit has been designed to make your purchase as simple and complete. The Harmony Béton waxed concrete wall kit is specially designed for finishing wall surfaces of 2, 5 or 10 m2, and includes all the necessary products for this operation: bonding primer, mortar and finishing wax. This kit is not designed for application to bathroom or kitchen walls. This kit has been specially produced by Harmony Béton to enable you to produce imprinted concrete surfaces. It contains all the products necessary for producing 25, 50, 75 or 100 m² surface areas. The kit does not include tools. Protection Kit for surfaces of 25 to 100 m2. In order to effectively protect your concrete surfaces, apply a coat of wood filler and two coats of lacquer Optimum. Depending on your tastes, choose between a matte, satin or gloss finishes ! Our wet-look glaze is a polyurethane glaze that protects and enhances the colours of the medium. Two layers of the glaze gives the medium a wet look. Even one single coat still protects your concrete. The kit polished concrete Pro includes all the necessary products to make surfaces for 5, 10, 15, 20 and 50 m2, 5 mm thick, with a primary Pro (epoxy resin). The polished concrete is a coating that has the advantage of being able to ask quick and simple. This patinated concrete kit contains all the products youll need for producing surface areas of patinated concrete from 5 to 50 m². The imprinted concrete kit for slab or tiling has been specially designed to enable you to produce 25, 50 or 100 m² of imprinted concrete on an already-existing slab or tiling. It contains all the products necessary. Using our coloured concrete topping, you will be able to apply the imprinted concrete at a thickness of 2 cm. You want to modernise the tiling in your bathroom? We have a waxed concrete kit for bathroom tiling. With this kit, in addition to no longer having to clean the joints between your tiling, youll add a touch of trendy and soft-to-the-touch decoration. Your bathroom will be a practical and pleasant room. Want to get rid of those joins between your tiling? Weve designed a special waxed concrete kit for kitchen tiling. With this comprehensive kit, youll be able to refurbish your work surfaces, sideboards and even your kitchen floors with great ease. With our selection of 30 timeless colours, youll bring that touch of essential decoration to your kitchen. A stairway is part of your decor; it can be as important as a nicely-decorated room. With our comprehensive waxed concrete kit for covering a tiled staircase, youll lend style to this oft-forgotten part of the house. And with our colour chart of 30 gentle and trendy colours, youll be able to design your own decorative touch. Our special waxed concrete kit for floor tiling will allow you to produce surface areas of 2, 5 or 10 m² concrete over your old tiling. You want to rejuvenate your bathroom? We have a waxed concrete kit for your bathroom floor. With Harmony Béton, your bathroom will be a practical and pleasant room. This kit has been specially prepared to enable you to produce 25, 50 or 100 m² surface areas of moulded concrete. It contains all the products necessary for a superb job on your outdoor places. Year after year, your moulded concrete will acquire a natural patina reminiscent of the appearance of the real thing. A few hours of work for years of peace! A kit including everything to apply the spray concrete on a concrete. Thanks to our kit Spray mortar, you'll be able to renovate easily floors to concrete without carrying out major work, the long and binding. A kit including everything to apply the spray concrete on a floor tile. For a perfect result, lasting finish matte varnish on a tile that already exists. Our comprehensive Harmony Béton acid stain kit includes all the products you need for permanently colouring a concrete slab. The kit includes surface preparation agent, colouring acid, neutraliser, and wet-look glaze. Harmony Béton acid stain remains stable over time and withstands light and sunlight for years. Harmony Béton PermaPro SL glaze is a methacrylate resin-based glaze that durably protects your concretes externally and heightens the colour. It will give your concretes a satin finish. Ideal for protecting your concrete terraces and driveways! The kit XXL polished concrete for your floors tile is a kit that allows you to perform a soil with a surface area of 25 m2 or 100 m2 with the best protection possible, the varnish is optimum. The Optimum wax concrete kit for walls is designed for wall surfaces of 2, 5 or 10 m² subjected to moisture or stains (bathrooms or kitchen walls). The Standard Smooth Concrete Kit contains all the necessary products for surfaces of 12, 15, 20 and 50 m2 on 5 mm thickness with a standard traditional primer. You want to rejuvenate your kitchen? We have a waxed concrete kit for your kitchen floor. With Harmony Béton, your kitchen will be a practical and pleasant room. Need to renovate your bathroom and especially the shower?We offer a complete kit with all the necessary products to cover your tiled shower. The floor of your kitchen is tiled. Give it a youthful look with our waxed concrete special tiled kitchen floor kit. This kit contains everything you need to renovate your floor.